It's Antiques Week, and though sometimes I fire up the trusty steed and hightail it for the Armory, this year I must stay in Maine. I should have kept the plaster column lamp. I really should have. You can't really see it, but the amusing little print to the left is an 18th century French fashion print, done during the balloon craze of the late century, of a woman with a high hairdo done up to resemble the Montgolfier balloon. The print leaning on the chair, a rare English print showing a fencing match before the Prince Regent, featuring a cross-dressing swordsman. Oh those English! Okay, here's the key to my taste: if it's painted, pale, and slightly classical, then I'm a goner, gotta have it. As I said, if its off white, classical...guess I'm just an old fashioned boy. I was going to keep this, but a nice friend of JCB passed through and away it went. At least it went to a good home. Looking for all the world like a Roman Emperor, it's actually Daniel Webster. oh more posts of your shop please! i'm a fan of your bookcase as well!!! 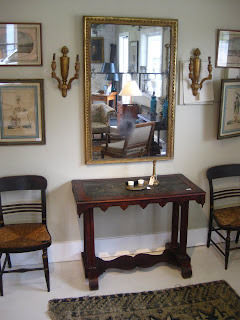 I am crazy for the two french tables. Nice post..
Like a draft from a window blowing away the Dilettante's smoke screen, I can say his collection reflects diligence. Far better than mere offerings from a "fevered mind"...his shop is beautiful! I say DED, this is all quite delicious! Thank you for more pictures, you do, indeed, have a marvelous eye and I look forward to someday visiting your shop. We had a fruitful Antiques Week here in Gotham and I shall be posting pictures of our little haul in the next several days. Fun to compare notes! Thanks ever so for showing your devoted readers a further glimpse into your fevered mind. i suffer from your illness also. my house is crammed with chairs of all periods and 50000 other things but i digress. i recommended that zach put you on his site. i'm in maine also but from the non-tony part.